Georgia is a country in the Caucasus on the edge of the Black Sea. During 1991-1995 its full name was the Republic of Georgia but since 1995 it is Georgia as written in the Constitution. It used to be part of the Soviet Union, but now it is an independent republic. The population of Georgia is about 4.5 million. About 1.3 million of these live in Tbilisi. People from Georgia are called Georgians. Most of them speak Georgian as their first language, though some people also speak Azerbaijani, Armenian, Russian or other languages. The Georgians are an ancient people. Their Capital Tbilisi was founded around AD 400, after the end of the Roman Empire . Western Georgia was part of the Roman empire before then. The Arabs captured it in 635 AD. The culture continued and they flourished through trade. In the 900s Arabs were weaker and the gelorgians became their own country again. It was the major country in the region until the Mongols invaded in 1223. Georgia was part of the Mongolian empire for a century on and off until 1334, when King Giorgi V took over. In the 1500s the Persians invaded Georgia four times from 1541-1544. In 1555 the Kings of Kartli ruled through the will of the Persian shahs. In 1783 The treaty of Georgievsk was signed between Catherine the Great of Russia and King Herekle, giving Russia the power to protect Georgia. Then, in 1798 the Persians burned Tbilisi to the ground. In 1991 Georgia declared their independence and they have been their own country ever since. 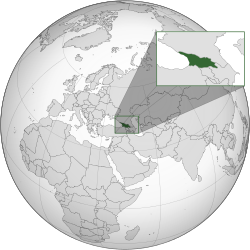 There was a rough patch between 1994 and 1995 when the economy was poor, but now Georgia is a country with close ties with the United States. They are currently applying to NATO. ↑ "Article 8", Constitution of Georgia. In Abkhazia, also Abkhazian. ↑ 3.0 3.1 "CIA Factbook Georgia". Cia.gov. https://www.cia.gov/library/publications/the-world-factbook/geos/gg.html. Retrieved 2012-06-10. ↑ "Statistics Georgia". GE: Geostat. http://www.geostat.ge/?action=page&p_id=472&lang=geo. Retrieved November 2, 2010. ↑ 5.0 5.1 5.2 5.3 "Georgia". International Monetary Fund. http://www.imf.org/external/pubs/ft/weo/2011/01/weodata/weorept.aspx?sy=2008&ey=2011&scsm=1&ssd=1&sort=country&ds=.&br=1&c=915&s=NGDPD%2CNGDPDPC%2CPPPGDP%2CPPPPC%2CLP&grp=0&a=&pr.x=30&pr.y=16. Retrieved April 26, 2011. ↑ "Human Development Report" (PDF). United Nations. 2010. http://hdr.undp.org/en/media/HDR_2010_EN_Table1.pdf. Retrieved November 5, 2010. This page was last changed on 6 September 2014, at 09:54.